Like many parents, Ukraine native Nika Mirzoyan’s desire to cook great food came after her journey into married life, in the beginning stages of raising her family in Beijing. 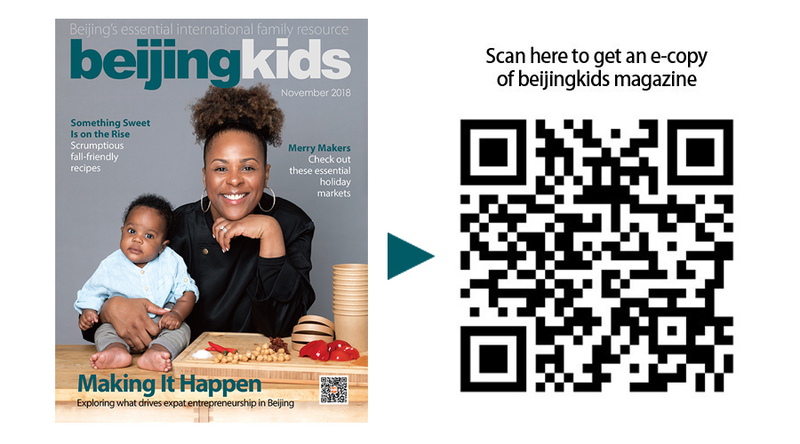 After nine years in the capital, she has grown her interest in the culinary arts into a small business that is gaining some traction and reputation among the city’s expat community, and her husband Anton, and two children Alexander (9) and Sophie (5) are reaping the confectionary benefits. 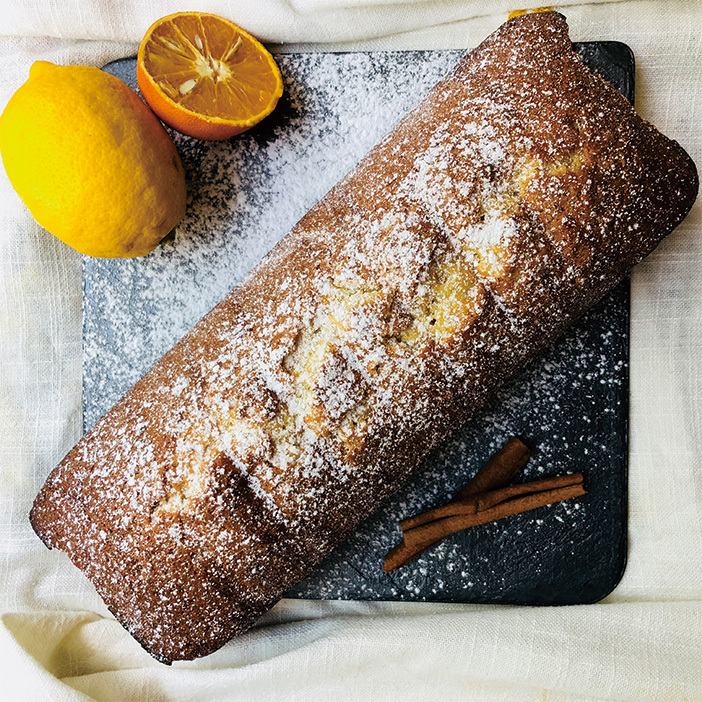 While Mirzoyan’s recipes for citrus bread and her classic take on cinnabuns are both tasty and suitable for intermediate bakers (not as over-the-top as her cakes), they are the perfect additions to your fall cooking regimen, especially as temperatures begin to drop. We hope you are ready to advance your baking game to the next level with these sweetbreads, and always remember that cooking is all about magic! Make sure to follow Mirzoyan and her delicious creations on WeChat (Nika_Mirzoyan). 1. Mix all dry ingredients (flour, baking soda, and baking powder). 2. Put the sugar in another bowl, then add your orange zest from one fresh orange and the vegetable oil, and mix well with blender. 3. Add eggs, orange juice, and unsweetened yogurt, then mix together. 5. Grease the pan with butter, cover with flour, and pour in your dough mixture. 6. Bake at 180 degrees Celsius for 40 minutes. 7. When about ready, the bread should crack at the top. 8. Using a toothpick, check the center of the bread to make sure the loaf is dry in the middle. 1. Mix sugar and 40ml of orange juice in a sauté pan. Boil until the sugar combines with the juice. 2. Place the baked bread upside down, then stab holes throughout the bottom with a chopstick to let it soak in the orange syrup. Then you are ready to slice and serve. 1. Pour 1 tbsp of sugar and the yeast into warm milk (35-40 degrees). 2. Add 3-4 tbsp of flour, cover with a towel and put in a warm place. 3. In the other bowl, whisk eggs together and add to milk, yeast, and flour mix. 4. Add sugar, vanilla sugar, and butter, then mix again. 5. Sift the rest of the flour, then add salt and mix it in. 6. Work these ingredients together until it is soft and doughy. 7. Cover it with the towel and put in the warm place for 1-1.5 hours. 1. Roll out the dough to a thickness of 3-5mm. Butter it and top with the mixture of sugar and cinnamon. 2. Roll dough into a loaf and cut in circles approximately 2 cm wide (making 12 pieces). 3. Put the buns in a pan, leaving a 2-3cm gap between them. 4. Cover with a towel and leave for 15 minutes. 5. Bake for 30 minutes at 180 degrees Celsius. 6. 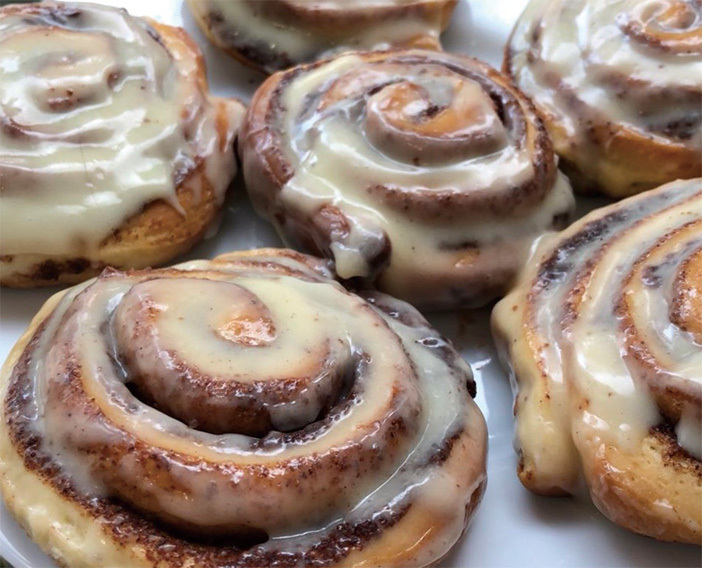 Mix all of the ingredients for the glaze together and pour it on the hot cinnabuns.